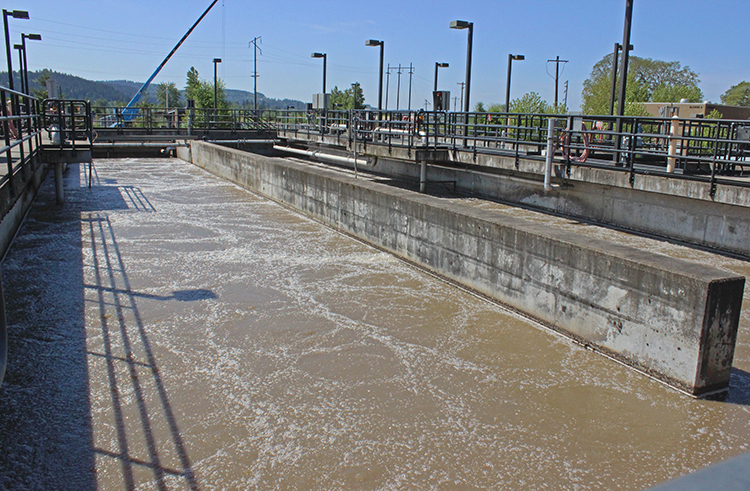 On an average day, five million gallons of used water from homes and businesses in Forest Grove, Cornelius, Gaston and parts of Hillsboro are treated at the Forest Grove Wastewater Treatment Facility. The conventional treatment process takes about 24 hours. Large mechanical screens trap and remove inorganic materials from the wastewater like, wipes, dental floss and q-tips. These materials are collected in a dumpster and then disposed of in the local landfill. Screened wastewater is transferred to a pair of enclosed, circular basins that allows grit like coffee grounds, rocks, and dirt to settle out. Grit is rinsed, collected in a dumpster, and then disposed of in the local landfill. Once the larger inorganic materials are removed, the wastewater is ready for treatment. The aeration basin’s primary function is to remove pollutants using microbes (tiny, naturally-occurring organisms). Oxygen is excluded and added to the basin sequentially to control the microbe population to optimize treatment. After the microbes treat the water, it is ready to be separated into solid and liquid resources. Solids and liquids are separated in the secondary clarifiers. The microbes enter into a large circular tank to settle. Settled microbes are returned to the aeration basin for continued use. Excess microbes are removed from the treatment process so a healthy population is maintained in the aeration basin. The removed solids are further processed and used for beneficial purposes like land application on farmlands. The liquid from the secondary clarifiers continues in the treatment process for disinfection. 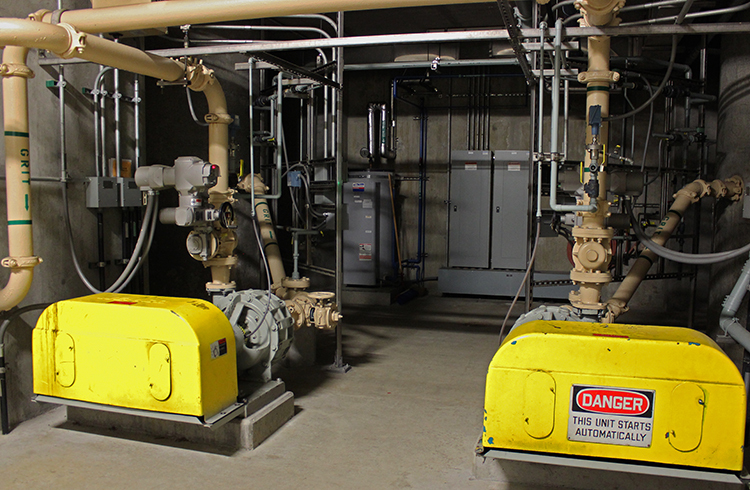 Treated wastewater from the secondary clarifiers still contains small amounts of bacteria. Ultraviolet or UV light, kills bacteria to protect humans and other living things. UV disinfection is a chemical-free, safe way to treat the water. After this step, treated water is ready for nutrient removal before being returned to the Tualatin River. The Natural Treatment System (NTS) creates an ecological bridge between the treatment facility and the watershed, where water is cleansed further, cooled and naturalized before its return to the river. See a map of how water moves through the Fernhill NTS or follow the steps below. Nutrient filters are designed to remove ammonia, which is harmful to fish and wildlife. The nutrient filter at Fernhill uses a six-foot deep bed of gravel that acts as a host for ammonia-removing microbes that occur naturally in streams and rivers. The approach used by Clean Water Services is to actively maximize the population of these microbes (many times more than in nature) so that the filter removes the ammonia before it continues on in the natural treatment process. In the summer over an average five-day period, treated water travels through the NTS. Waterfalls aerate the water, native plants absorb nutrients, and the water is cooled through evapotranspiration (water is transferred to the atmosphere by evaporation from the soil and other surfaces and by transpiration from plants). Thousands of wetland plants continue to remove trace constituents to aid the conventional treatment process. 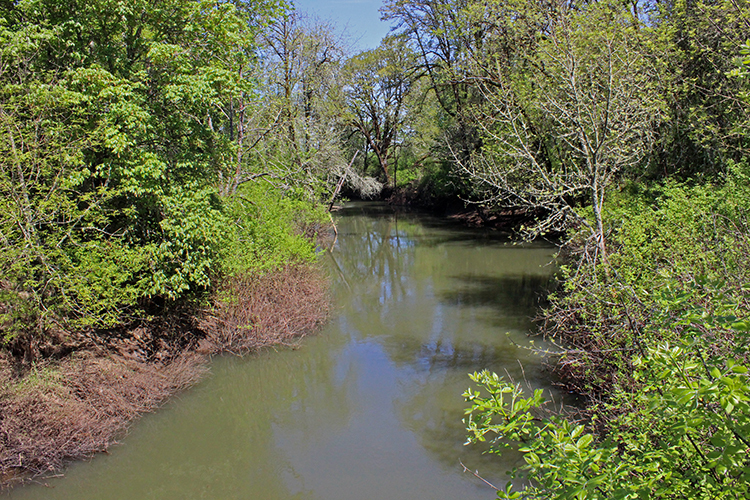 Naturally treated water is returned to the Tualatin River to rejoin the water cycle and be used again.